We shopped at Ikea one weekend and ended up watching the kitchen installation demo. The kitchen had been a project that kept getting pushed down the list of house projects because it seemed like a huge ordeal and I didn’t want to be without my kitchen. But, we figured if we watched the demo, we could deduce for ourselves how hellish it would be. Michael Early did the demo and is a wonderfully personable guy (he is also the contracted installer for Ikea cabinets). He pointed out some tips and tricks he’s learned throughout his 40+ years of installing Ikea cabinets (it’s all he does) and we started thinking that maybe we didn’t want to install cabinets by ourselves. But, that weekend he was offering 10% off his installation costs, he’d give us a discount if we build the cabinets ourselves, and Ikea was having that no-sales-tax weekend. We went home to discuss the logistics, somehow calculated that we could be done in 1-2 months, went back to Ikea the next day and ordered the cabinets (kitchen plus bathroom). T had no idea what he’d been talked into. Or maybe he did and he was too sweet to put his foot down. While we’re there, we also got the quote for solid surface countertops and talked the guy into giving us a free upgrade on the countertop edge style. Or maybe he totally suckered us into it by saying he’s giving us a free upgrade. Later in the week, Michael Early came by to do the official measurements and go over the cabinet layout. We ended up removing the long bar and overhead cabinets and moving the fridge from one wall to another (not as big a deal as it might sound). The deep pantry was going to be ripped out and replaced with pantry cabinets and slide-out shelves. We planned to have an island with storage all around it. The measurements worked out and we set an installation date for early May. That gave us about 5 weeks to get everything ripped out and prepped for the cabinets. On paper, it sounded reasonable. We soon found out we were crazy. We decided to do all the demo work ourselves, saving $600-800 if we had Michael Early’s guys do it. On one hand, that’s quite a chunk of money. On the other, it ended up being a huge chunk of work. The tile backsplash didn’t want to come off the wall, which meant the drywall got torn up and we ended up hanging new drywall throughout the whole kitchen (bonus: now the drywall is practically new and well secured!) The existing tile counters were ridiculously hard to break down and I’m still not even sure how T managed to do it all by himself. 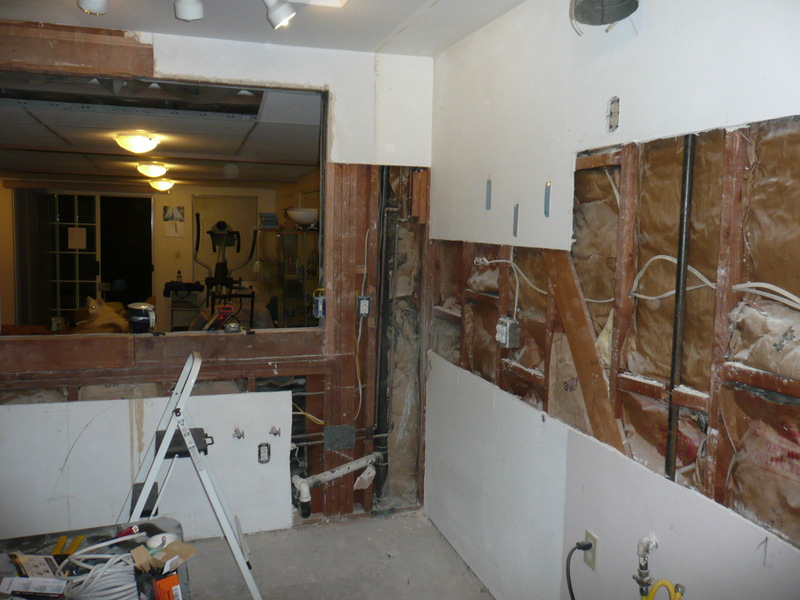 Everything we removed meant putting in new drywall. And sometimes additional 2x4s. 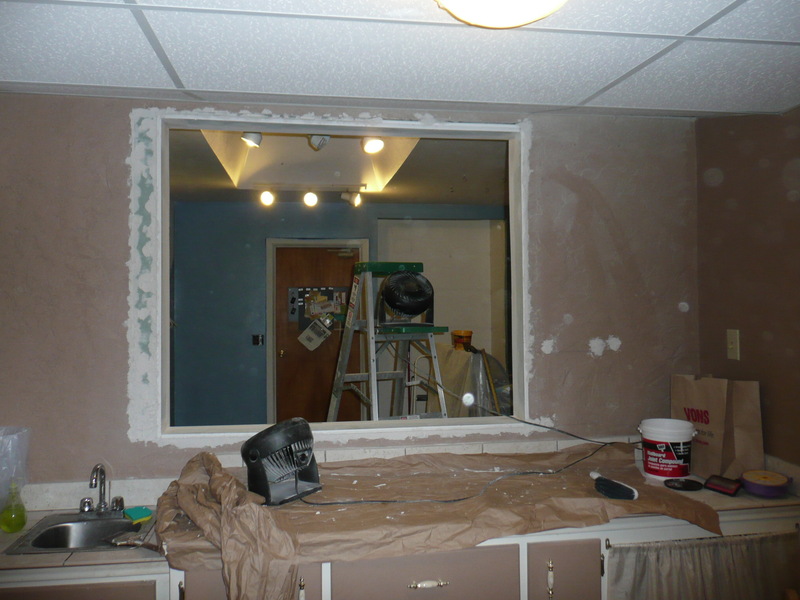 One of the goals of renovating the kitchen was also to remove this small window that use to be an exterior window – we wanted it gone and figured we might as well make the opening larger and more accessible to. That meant cutting into a header and then installing supporting posts. We actually did call some “handymen” for quotes, but they were all over $1,000 and they wanted to do the work over 3 weekends. T said he could do it, so that’s what he did. We found out that trying to cut through our exterior stucco was a real pain. It took T something like 3 blades on an angle grinder and it made so much dust. But he did it, then he framed it, and we got it done. 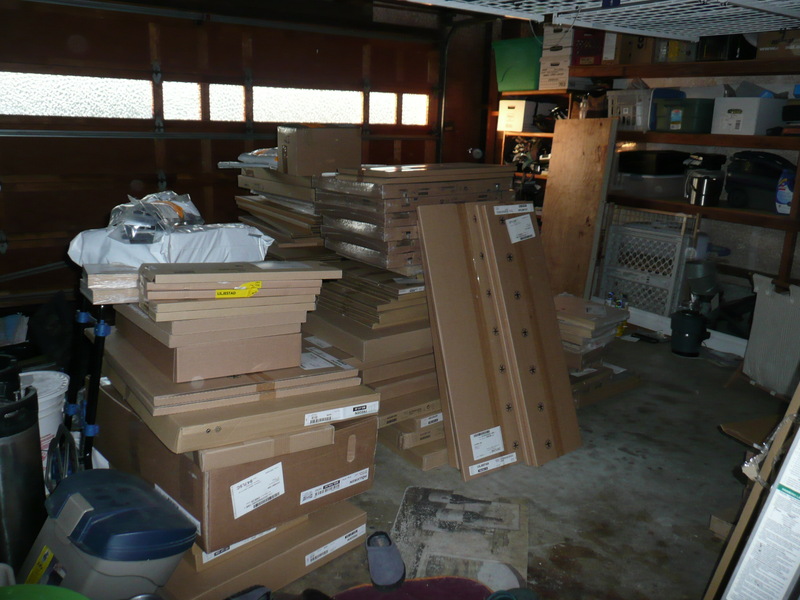 Usually, while he did the heavy demolition, I would be in the garage assembling cabinets. I thought it would be an easy task since we’re all well-versed in putting together Ikea furniture. True, once you get a couple assembled you can see how the rest will come together, what this screw does, which panel goes on which side… but when you have 30+ cabinets to put together, it becomes a massive project. While we had the drywall torn down, we figured we would also take the opportunity to move some outlets and switches to make them more user-friendly. The garbage disposal switch was way in a corner and I always had to step on the cabinet to reach it (hey, I’m short). We wanted to move it closer to the sink and add an outlet next to it for things like the coffee grinder or a blender. We were doing pretty well with the electrical (one of T’s friends helped) until something got wired backwards (or something) and a fuse blew. We ended up hiring a real electrician to fix it and while he was there he ran an electrical line to where the island would be. Plus, he did the electrical outlets and vanity light in the bathroom. Best $500 ever spent. We also ripped out the existing hardwood and installed the same laminate flooring that was in the rest of the house. I thought it made everything look more continuous and I’m happy we ended up doing it that way. 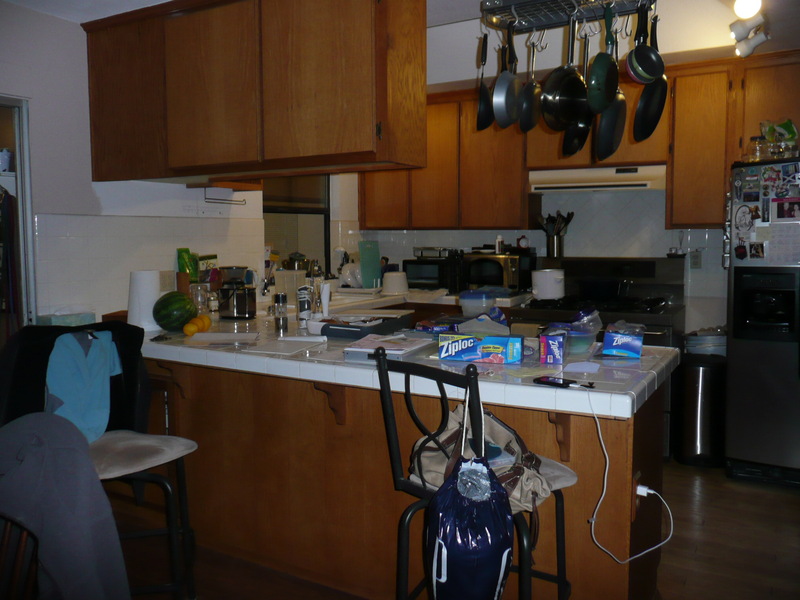 I wasn’t a fan of having a dividing line of materials… I think it made the kitchen look smaller. The flooring was actually one of the easier parts of the renovation. The day before the cabinets were going to be installed, T and I rushed to get the drywall and painting done. We made it, but we also ended up with some minor drywall mud flaws (that you would probably only see if I pointed them out to you). Once the cabinets were installed, the countertop guys came to do their final measurements. Then the range hood was installed, cabinet knobs put in, side panels fit, and we installed the dishwasher. The dishwasher we did ourselves and it’s one of my favorite things about the new kitchen. We bought it from Ikea because you can attach a matching cabinet panel to the front so it blends in. We’ve actually had people ask where the dishwasher is and it kind of makes me happy. Plus, it works, which is more than I can say for the old one. Once the cabinet doors were finished, the countertops installed, and the under cabinet lights plugged in (the electrician did this, too), we had to unpack all the boxes and put everything away. 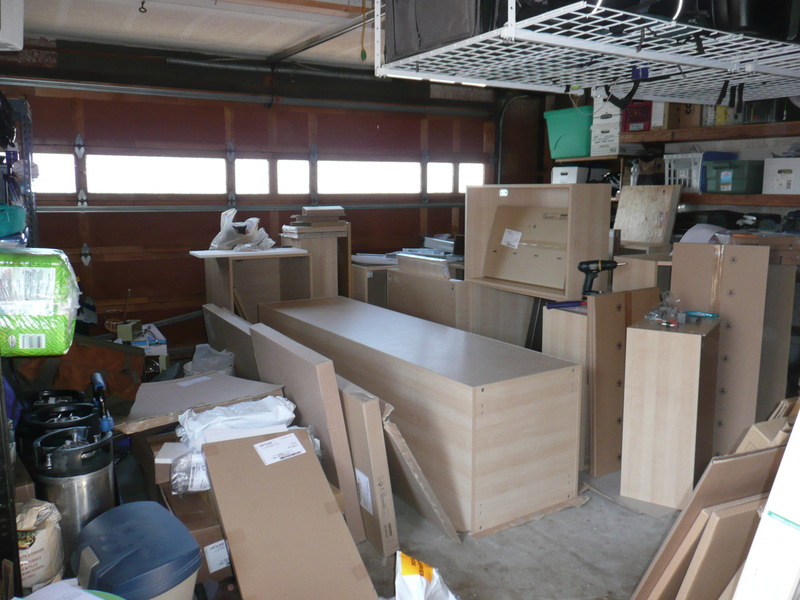 Surprisingly, because the new cabinets and drawers were more efficient, we were able to store everything in less room. And we’re able to get to it easier, which means we actually use things like the waffle iron and blender. 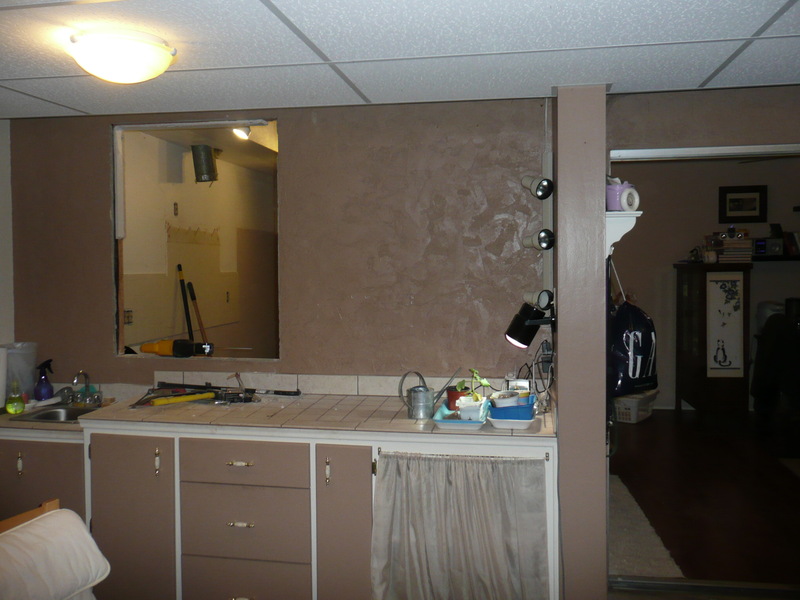 You can see all the pictures from our Remodel project on our Photo Site. All in all, it took us a little over two months from the first demolition to putting away the final can of peas and touching up the wall paint and texture. It was a huge project and not one I’m eager to recommend to anyone. It took all of our spare time from the moment we decided to go through with it, plus our weekends, and we were tired. I’m glad we did a lot of that work ourselves, though, because I learned a ton about drywall, drywall mud, electrical wiring, measuring, and laminate flooring. I thought that one of the challenges of being without a kitchen would be the overall functionality. You hear people talk about getting by with just a microwave and a toaster. Between our toaster oven, microwave, coffee pot, and outside grill, I was not in the least bit worried about being able to cook during this renovation. We even still had our fridge plugged in, even if it was in the dining room. Want to know why we ended up eating a lot of pizza and going out for two months? Because I had no kitchen sink. It would have been easy to cook meals for us; it would have been totally not worth it to try and clean it all up in the tiny bar or bathroom sink. If I can impart one piece of wisdom I learned from all of this, it would be: maintain an adequate sink and dish drying area if you think you’ll be cooking during a kitchen renovation. There is a lot of fussy, fiddly, nitpicky work when hanging cabinets that I am so glad we didn’t try and do it ourselves. Yes, Ikea cabinets have this nifty upper rail that you attach the upper cabinets to, but you have to make sure everything is level and square, you have to make sure the bottom cabinets are level all across (and don’t think your floor is automatically level), and you have to figure out where to put the tiny spaces and trim pieces because no kitchen perfectly lines up with cabinet dimensions. Then, when you’re putting in the crown moulding, you have to account for the ceiling not being level and how to deal with seams in the moulding. All this was done in two days by people who do it day in and day out. We (I) decided to put in deep drawers in the island instead of cabinets and I added the Ikea drawer dividers. In them, we store Tupperware and storage containers, mixing bowls, strainers, and the blender/food processor. I can’t even tell you how easy it makes life to just pull the drawer out and lift whatever we’re looking for onto the island counter. No more bending down and digging in the back of a cabinet for something. We also put a corner lazy-susan cabinet next to the sink, so it all pulls out and you can access every last bit of space back there. I love it. One of the main reasons we went with Ikea cabinets (aside from the good price) is because their pull-out shelves are so reasonably priced. That, and you can add drawer and door dampeners to everything for $5. If you were to look at a standard cabinet display, replacing a regular drawer with a drawer with a dampener would add $200. Per drawer. But, back to the shelves. The pantry is still about 24″ deep, but because every shelf pulls out completely, I can get to every can in the back easily, even if it’s on the top shelf. And, I don’t have to pull anything out to get to whatever is in the back. I can access all my flours and grains and sugars, we can store food more effiiciently, and I can see what were using up so I know when to replenish it. The new pantry is probably my favorite part of the whole kitchen. No, no… it’s definitely my favorite part. Having outlets in the island is awesome. We have one outlet on each side and I’d say we use them weekly. Any small appliance is plugged in there and then we have all the counter space for prep work. I thought I wanted all glass cabinet doors, but they were only available for one set of our upper cabinets (based on cabinet width and style). We ended up putting glassware and plates/bowls/etc in those cabinets and now I’m glad we have solid cabinet doors for the mess of tea boxes and coffee filters and the corner cabinet that holds random mugs and other whatnots. We went with a single-bowl sink. 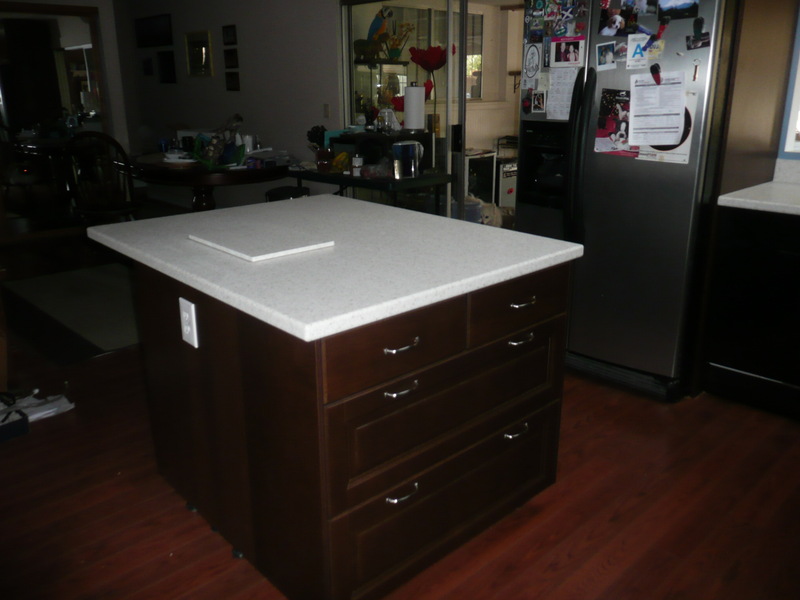 It was originally going to be an undermount stainless steel sink, but when I couldn’t find one that was a)reasonably priced or b) would fit within the 30″ cabinet space we had, we went with a solid surface integrated sink. Because it’s made out of the same material as the countertops, there is no seam. No crack for crumbs or spiills to get into. It makes cleaning so easy. We’ve had a few instances where stains don’t easily scrub off, but a quick spray with Clorox cleaner does the trick in a second. And, all my roasting pans and cookie sheets fit in the sink so I no longer swear when cleaning. trainer. LVMPD sgt ofc T and DEBRA WEBB. My privileges were broke by DEWEY as well.